[T]he gathering grew contentious when a woman representing an environmental advocacy group pressed Clinton on whether she would support banning fossil fuel extraction on public lands, including the use of hydraulic fracturing, the controversial natural gas drilling technique commonly known as fracking. Clinton had said in response to an initial yes-or-no question that she could not commit to such a ban until alternative sources of fuel were in place. "That may not be a satisfactory answer to you, but I have to take the responsible [approach]," she said. "We still have to run the economy. We still have to turn on the lights." Hillary Clinton's campaign has also accepted a lot of money from Wall Street banks, the sworn enemies of principled liberals like Bernie Sanders. 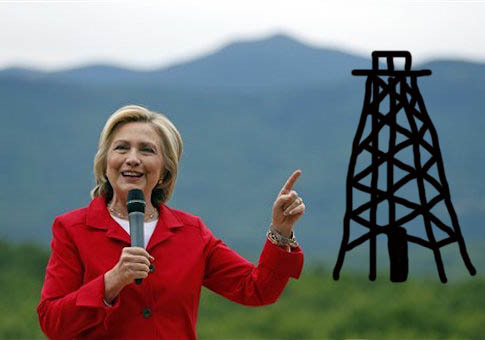 This entry was posted in Politics and tagged 2016 Election, Bernie Sanders, Climate Change, Democratic Party, Drilling, Hillary Clinton, Oil, Trolling. Bookmark the permalink.